I was driving along Highway 28 in Idaho, the Sacajawea Memorial Highway, through the Lemhi Valley, when I noticed a sign on my right, pointing east toward a smooth dirt road and a pass. The Beaverhead Mountains rose above the domesticated fields of the valley floor, prominent in the late afternoon sun. They sported jagged peaks and rocky slopes, remote and wild. I decided that back road must lead over them. I’ve traveled many highways and their back roads, some that stretched to distant horizons, others that disappeared over ridges, and still others that teased but were gated, mud bogged, or rockbound. I like the adventures back roads offer, especially when they come with a story. At the junction with the highway was a store. Surely its walls, bookrack, and occupants must know the history of this back road and its country—but it was late, I was pulling a travel trailer, and my destination at my in-laws house was still two hours away. I would have to return later. The following days were busy with visiting. Questions, however, continued to haunt me: Why was that back road there? Was it passable? What was it like to stand at the pass? One day during my visit, I went to a coffee shop, bought an Americano, opened my laptop, and began to search. 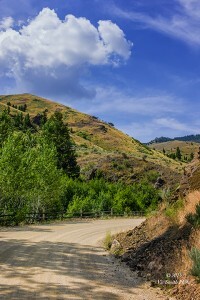 The back road I’d found was the Lewis and Clark Backcountry Byway, a 36-mile loop built by the Bureau of Land Management and the United States Forest Service in 1989. Its high point, Lemhi Pass, was where the Corps of Discovery had crossed from eastern to western waters. Their guide, Sacajawea, had led them to this pass and helped them obtain supplies and guidance from her people. I found many photos, videos, and road logs posted by modern travelers, loving the views along the road and at the pass and the power of American history conveyed by the byway’s monuments. I was bit. I had to return to the store, the backroad, and the pass. I had to hear some of the stories, to see the path, and to stand at the pass for myself. So not so long after I did return. The earth beneath the road and the pass had a story. The people who called the area home when Lewis and Clark passed through had a story. The people who came to call it home on the heels of Lewis and Clark had a story. On the backroad and at the pass I saw the earth’s magnificence. I found a welcome little dell in which to refresh my soul. I saw a story of American achievement, and I saw a story of the impact of that achievement on the Native American people who had resided there. I realized that similar impacts continue to echo through the halls of time, in communities of people and in the life of the biosphere around the world today. I found refreshment and responsibility.